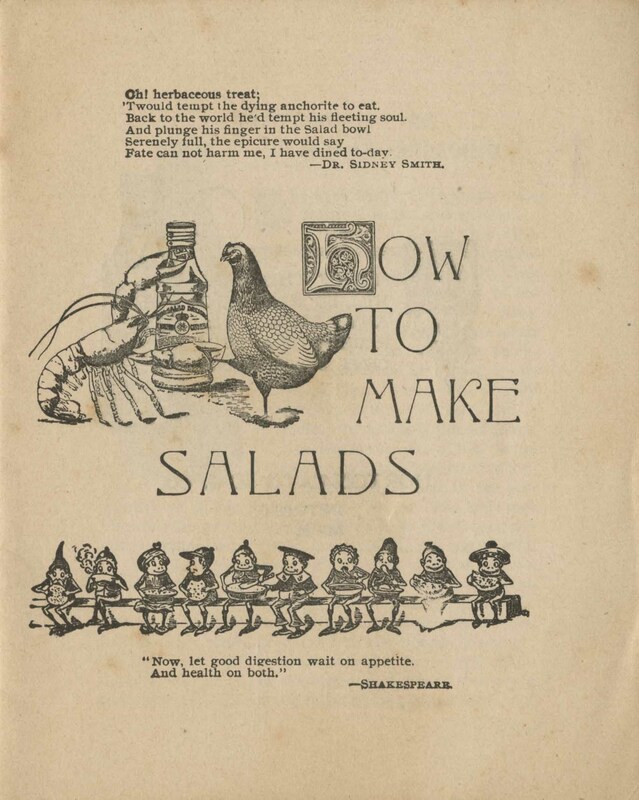 seafood – What's Cookin' @ Special Collections?! 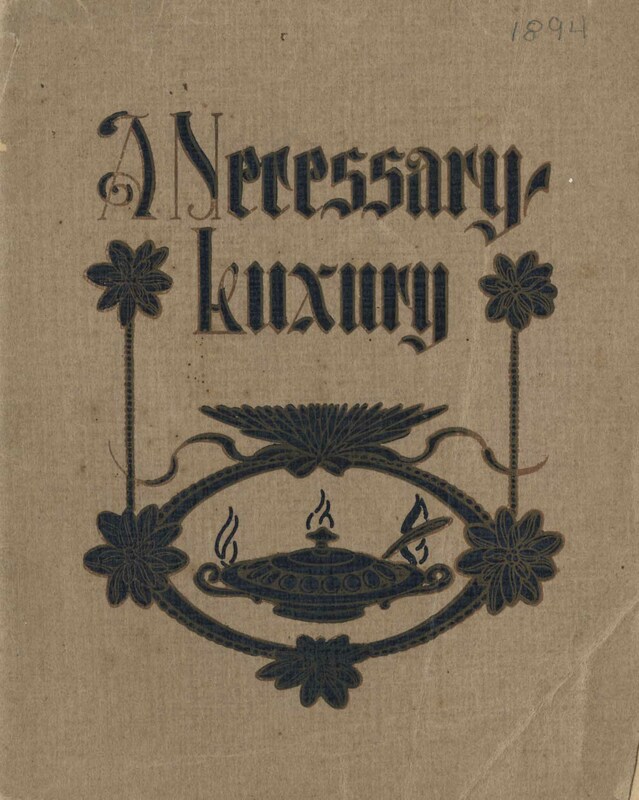 This week, I thought we’d look at a manuscript cookbook. At the moment, this particular item is considered unprocessed, but by the time this blog post is over, I’ll probably have done half of the work of describing the collection. So, there may even be a finding aid by the end of the day! Officially, this manuscript cookbook doesn’t have a title yet. It’s owner/creator, as we can tell from the inscription at the front, was someone named “Doris.” The cookbook was a gift from her mother in 1925. However, we don’t have many other clues as to the identity of Doris. Which, of course, can be the case with manuscript cookbooks. But more on that in a moment. One of the first things you might notice about this item is the cover. It’s not the original. Rather, a blank notebook (with nice marbled end papers) has been covered with what seems to be wallpaper. It was hand stitched in at the front and back, probably to protect from food debris. The cookbook has an index of recipes, which is always a fun trick. One never knows how many pages you might need for recipes of a certain type, so there are often blank segments or spaces. Or recipes for like items don’t end up together, when more get tacked on to the end! If you’ve spent anytime looking at handwritten recipe books, trends and recipe themes emerge: There is often a preponderance of cakes, cookies, puddings (or, “pudgings” as it appears here), and preserves. Because some of the pages are already loose and I didn’t want to stress the binding by placing it flat on a scanner, I decided to photograph the pages in today’s post. So, apologies for the addition of fingers and in some cases, less than perfect quality. One of our only clues about Doris also comes from a folded up sheet of paper stuck inside the cookbook. On one page, there is a recipe for the every-popular moulded salmon or tuna salad. In addition, there are some recipes from a 1964 Randolph Macon Alumnae Association luncheon. The cheese strata is attributed to Doris Rogers. While I don’t like to make assumptions, it’s possible this is the same owner of the cookbook. Although the cookbook does have a section of cheese recipes, it doesn’t contain a cheese strata (I was hoping to find a match!). Still, this could be a clue I’ll need to follow up on, if I can find some Randolph-Macon history! After page 165, the rest of this notebook is blank, which also isn’t uncommon when it comes to manuscript receipt books. Sometimes people lose interest, sometimes they begin collecting recipes in another way, sometimes it gets passed on to someone else (who may or may not continue to add to it). It seems that this particular cookbook did get use–there are loose pages from lots of turning and there are definitely some stains suggesting it spent time open in an active kitchen. The other reason I chose to highlight this item during my 2018 Women’s History Month series is to play against the posts I’ve already done this month. We started with Betty Crocker who, while not an actual person, is an icon. Last week, we looked at some women’s contributions to cocktail history, some of which were obvious, others a little less so. This week was an opportunity to point out that contributions to culinary history do not have to be identified, attributed, or famous. Rather, anyone can create a piece of culinary history that might just have a longer legacy that you expect. 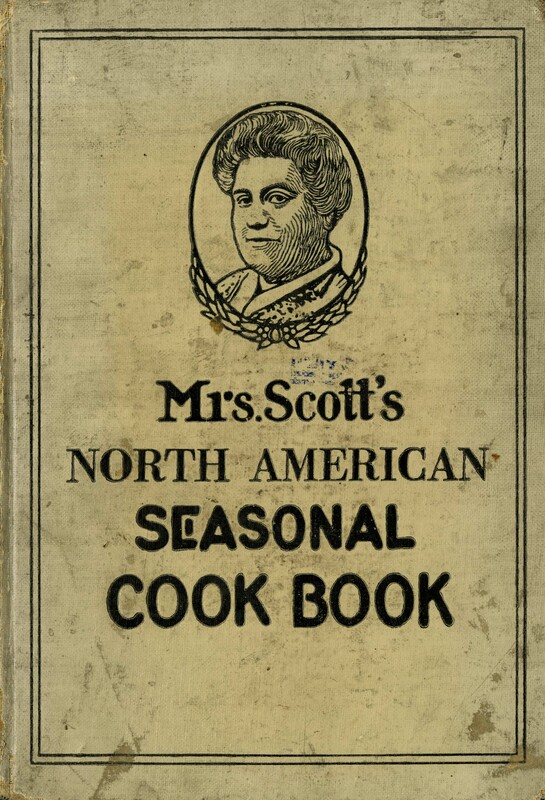 We have no reason to believe that Doris was keeping this cookbook for us to be able to share, but now, 93 years later, we have the option to make her recipes once again. After considering alternative decorations, I started thinking about color. If you really wanted to get into a theme, you could color your “frosting.” It turns out, despite the fact that we haven’t seen it in previous posts, I wasn’t the first to think of this idea. Next up isn’t a frosted sandwich exactly. It’s a bonus frosted item–an appetizer I found while looking for the party loaf above. 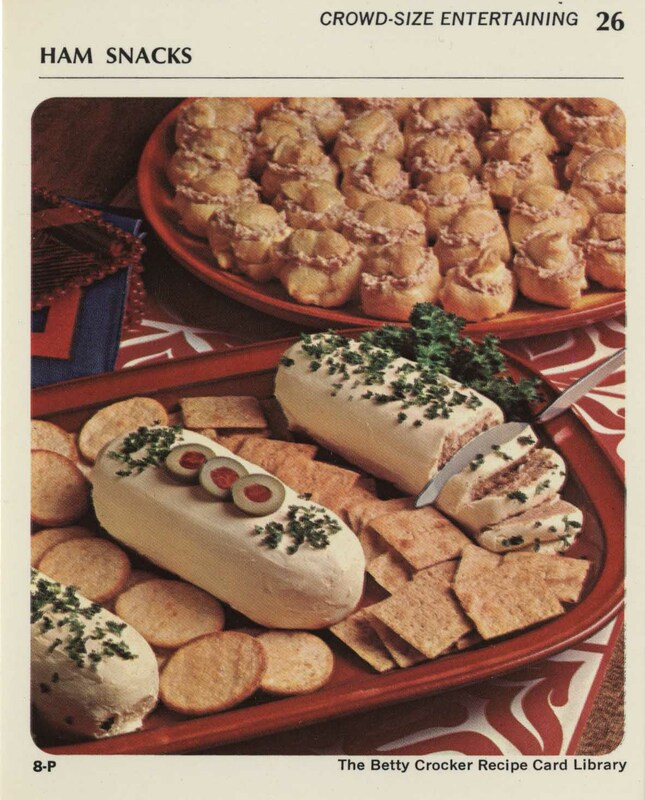 That’s deviled ham, rolled into logs, and frosted with cream cheese. It seems close enough. Put it between to crackers and voila! 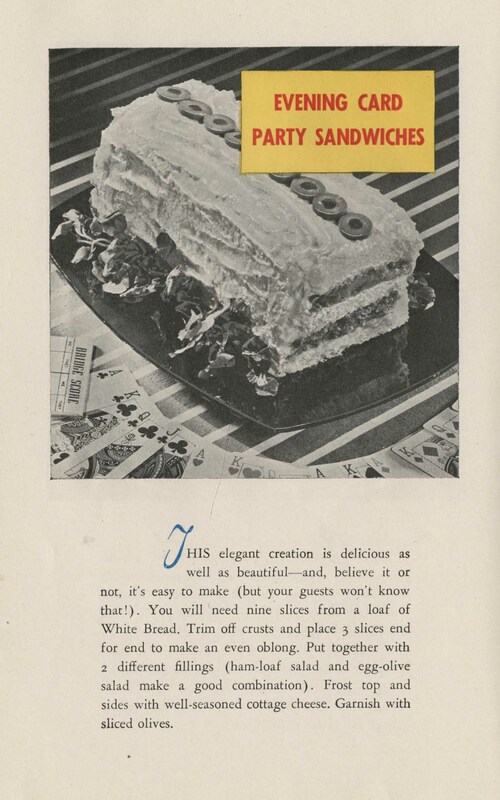 Our next frosted item comes from another pamphlet, “Sandwich Secrets,” sponsored by Dreikorn’s Orange Wrap Bread. 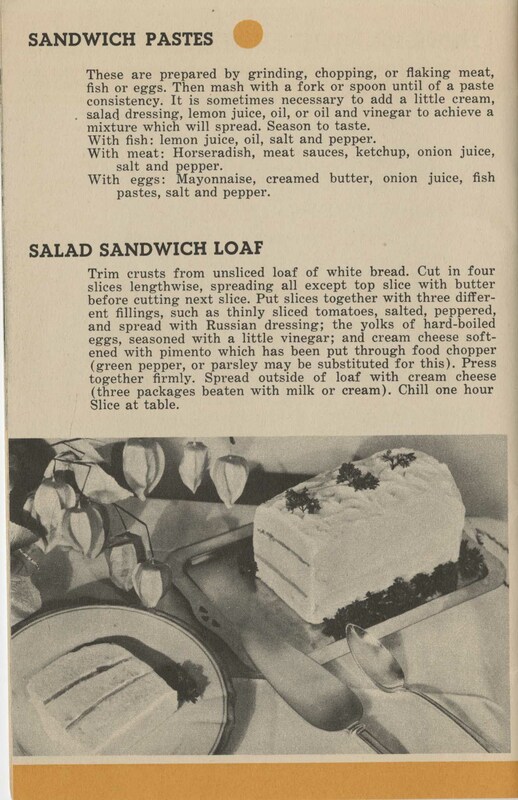 I scanned the whole page, since I thought any of the “sandwich pastes” at the top could also be potential fillings. We’re back to black-and-white images, which leaves much to the imagination, for better or worse. I did notice this version seems to have a far larger bread-to-filling ratio. And, it seems to have less frosting than many other variations. Perhaps that for the best? The last image in this week’s fascinating/terrifying post isn’t a sandwich, either. I’ve bombarded you with enough of those for the moment. It’s more…something to think about. The frosted sandwich isn’t something you’ll see on tables these days (no doubt we can guess why). But it seems there should have been more recipes during the height of its popularity. Besides the use of food coloring, “frostings” could have been adulterated in all kinds of way, including the addition of other flavors. 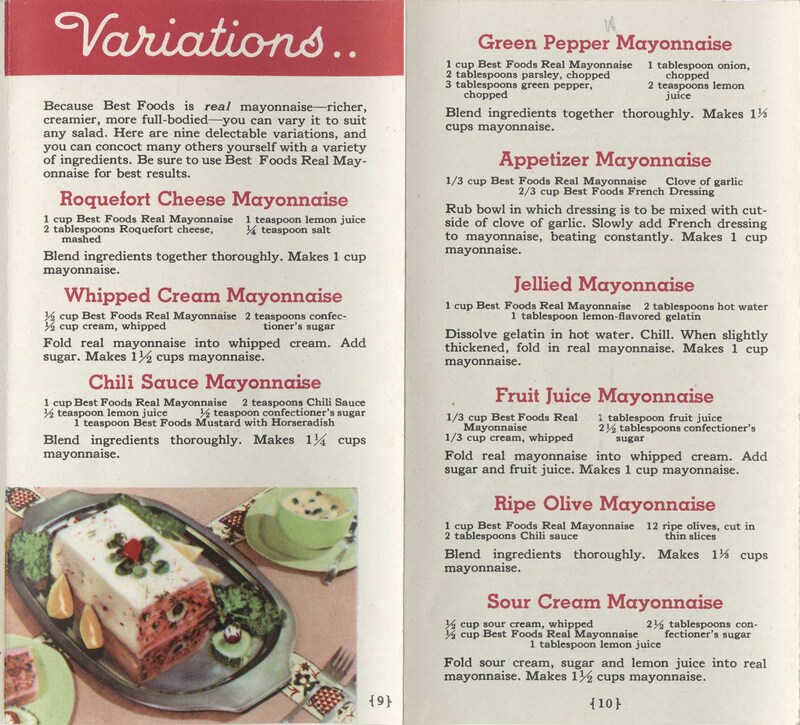 So, this week, I’m leaving you with a selection of flavored mayonnaise recipes from Best Foods, Inc. (and the picture of a salmon salad mold that you could mistake for a frosted sandwich, unfortunately–I did at first). Just imagine the possibilities for your next party! Got olives in a filling? Use an olive mayo. Try a chili sauce mayo on that ham and chicken salad filled sandwich. Using (gulp) fish/seafood fillings? Maybe it needs sour cream mayo. 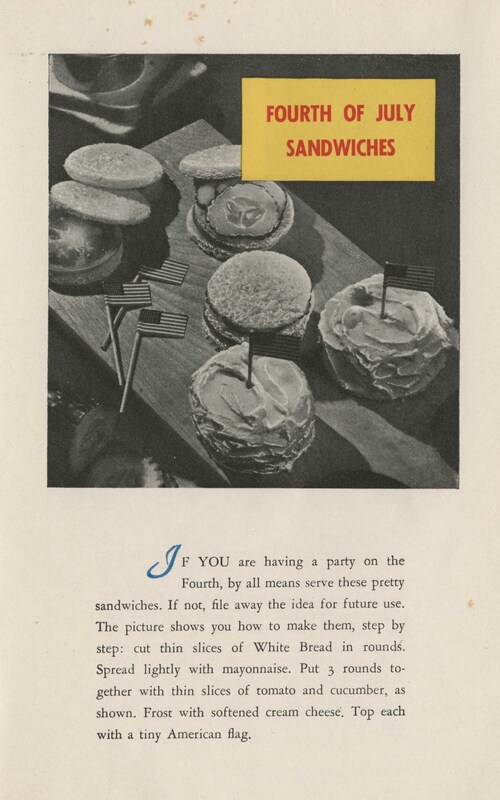 There’s even the potential for a sweet(er) frosted sandwich, coated in fruit juice mayonnaise! 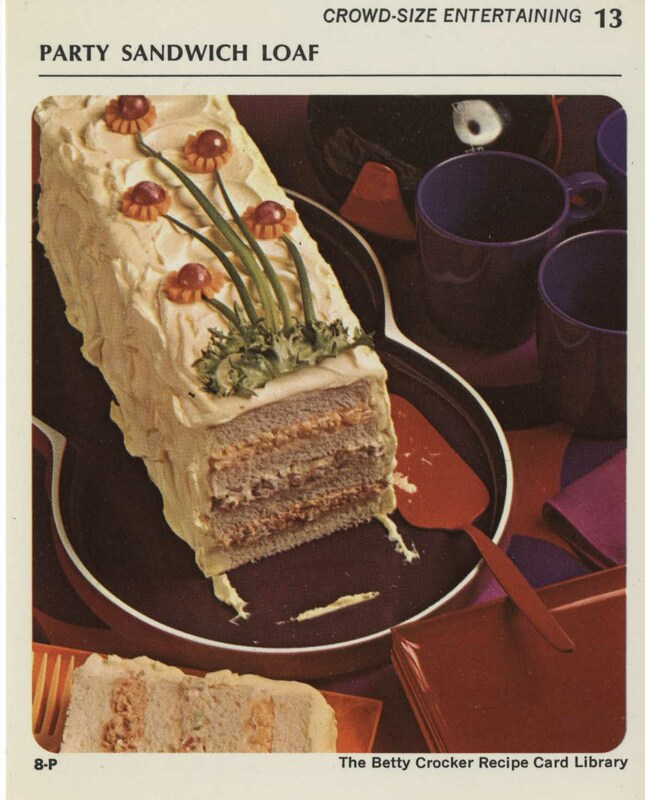 All my making fun of frosted sandwiches aside, I think they make a great example of a past culinary trend that materials in our collections can help you learn more about. There are foods that come and go, some once and some in waves. Other trends survive decades or even centuries. Researching culinary history is fascinating, fun, and a great way to come up with some strange facts to share with friends and colleagues. Whether you’re curious, scholarly, or both, you’re always welcome to visit us in search of recipes. Ring Out 2014–Culinary Arts Institute Style! 2015 is around the corner, which means it’s time for me to dig out the holiday cookbooks. I thought about a post full of candy, but it’s important to remember this time of year isn’t ALL about sweets. That being said, our feature item this week still has its fair share of holiday dessert classics. Let’s take a look at The Holiday Cookbook from the Culinary Arts Institute. It was issued and re-issued repeatedly, but ours is from 1957. The New Year’s recipes include a lot of seafood canapes (“Crab Nippies,” herring in sour cream, and shrimp cocktail), as well as heavy meat dishes like Yorkshire Pudding and rib roast. There’s stuffed or curried birds (“Curried Chicken with Broiled Bananas?”), an Eggnogg Pie, and three different eggnogg recipes, for those of you who can never get enough of the ‘nog. Apparently, one should ring in the new year with a rich diet! No matter what holiday you’re celebrating this time of year, who you’re with, and on what you’re dining, Special Collections wishes you the best! We’re looking forward to our holidays full of goodies (we’ve all been busy making our usual–and not so usual–treats for each other around here) and we hope you are, too! Happy Holidays and we’ll meet you back here in 2015!